Today is another snow day! I feel like I haven’t had a full week of school in forever, and I’m definitely not complaining. I’m especially happy we have a snow day today because it’s also my sister’s birthday! 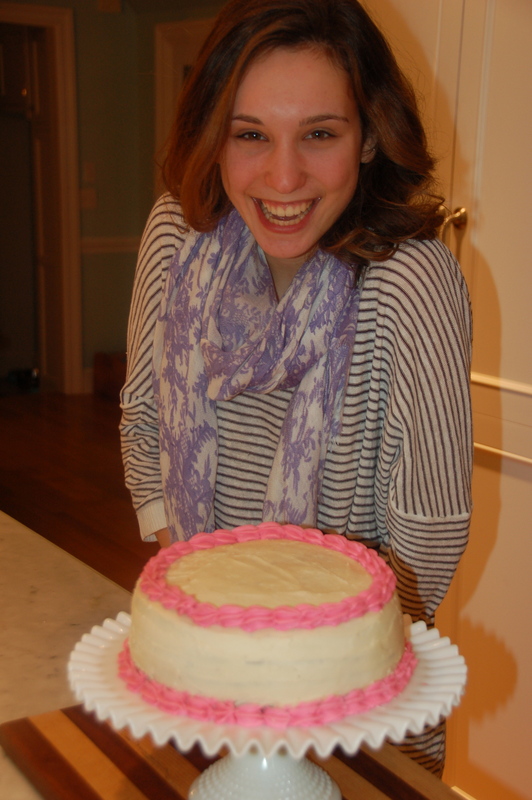 Now, I get to spend her whole special day with her, and enjoy the cake that I baked for her yesterday. This cake is a Dale family specialty. Because my whole family is obsessed with chocolate, for all of our birthdays we always have the same cake! I’m always willing to make any other type of cake that my family wants, but we always end up back at this no-fail chocolate cake. This chocolate cake is a classic. It’s quick and easy to make, always pops out of the cake pans easily, and stays moist and delicious for up to four days! 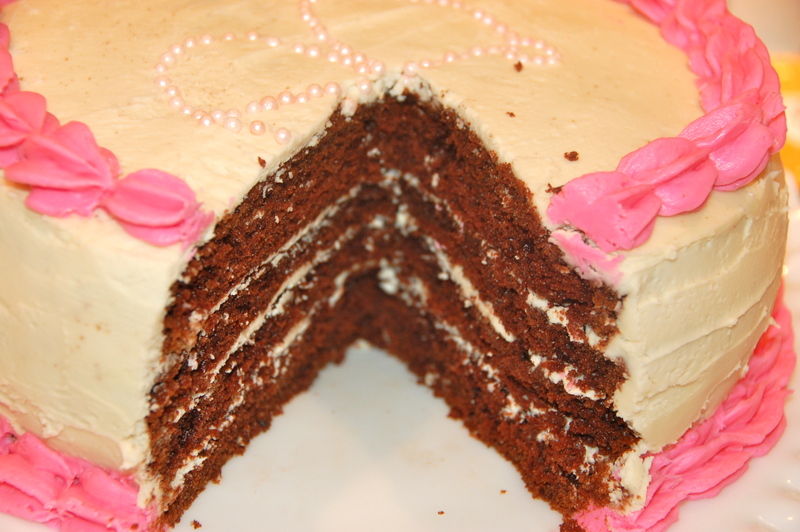 Instead of making four individual cakes for layers, I prefer to slice two cakes in half and layer them. 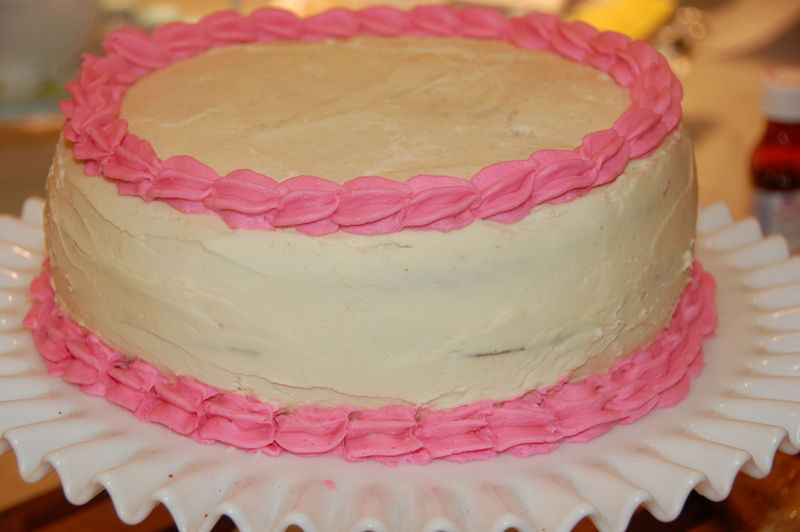 That way, you still have the four layers you want, but they’re much easier to layer and keep the shape of the cake. 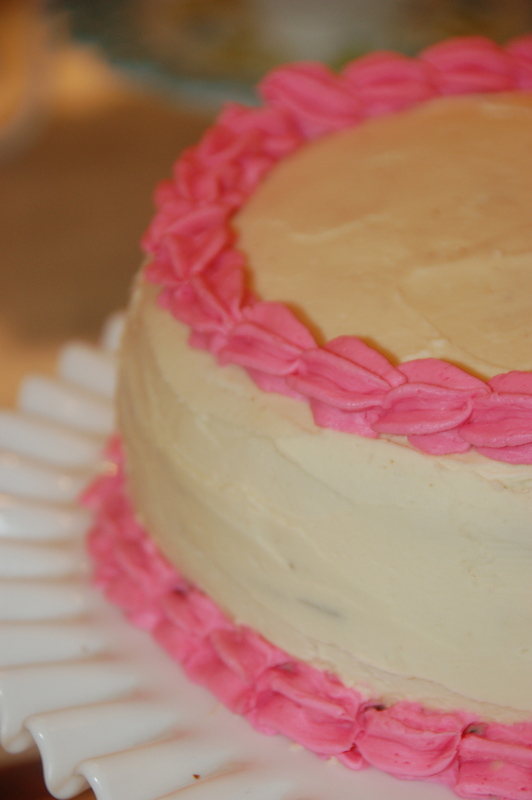 For the frosting of this cake, I always stick to a timeless vanilla buttercream. 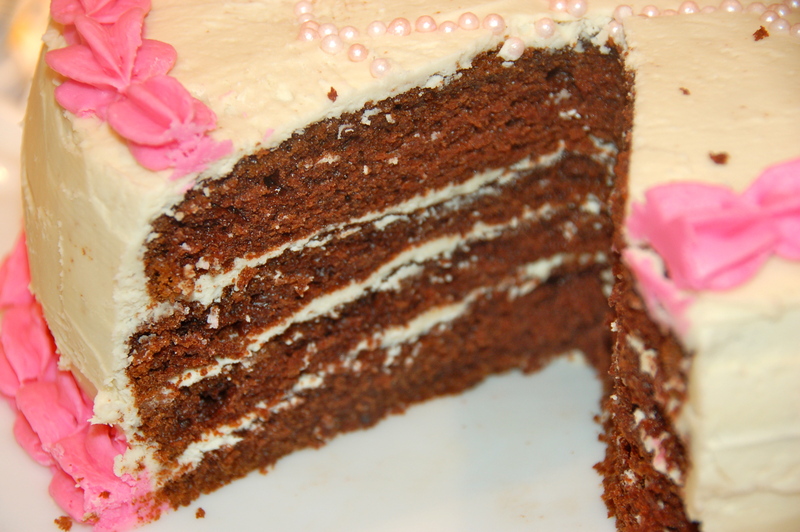 It perfectly compliments the dark richness of the cake with its light, sweet flavor. It’s super easy to make – I don’t even use measuring cups anymore for this buttercream, I’ve made it so many times! To finish off the cake, I made a B for Brigitte out of sugar decorating pearls. It adds a lovely sparkle to the cake – I definitely recommend using items like pearls and sprinkles to make your sweets more festive. Pop them on anything! They’re guaranteed to garner a smile! 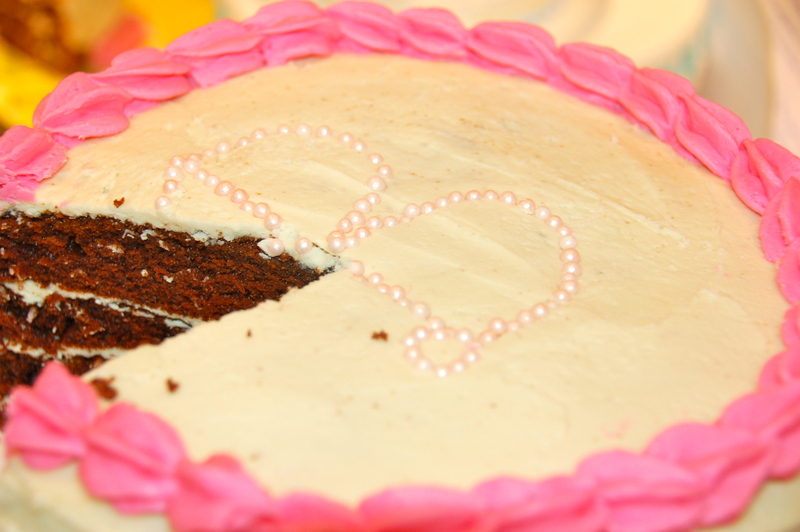 Preheat oven to 350º F. Prepare two 9-inch cake pans by spraying with cooking spray or buttering and lightly flouring. Add flour, sugar, cocoa, baking powder, baking soda, salt and espresso powder to the bowl of a stand mixer. Using your paddle attachment, stir through flour mixture until combined. Distribute cake batter evenly between the two prepared cake pans. Bake for 30-35 minutes, until a toothpick or cake tester inserted in the center comes out clean. After cooling for about 30 minutes, pop the cakes out, slice them into layers, and stack and frost them as desired. I recommend that if you’re using the vanilla buttercream, dirty ice the cake and put it in the fridge for about 15 minutes before finishing the frosting, so you don’t get crumbs! Using a paddle attachment in the bowl of a stand mixer, whip up the softened butter until almost completely white and fluffy, about 2 minutes. Scrape down the sides of the bowl. With the mixer on medium/low speed, add in the powdered sugar 1 cup at a time, until completely incorporated. Add in the vanilla. Color and frost as desired! Enjoy!